No Bothans had to die, in order for you to get your hands on the plans to the Death Star from Star Wars. 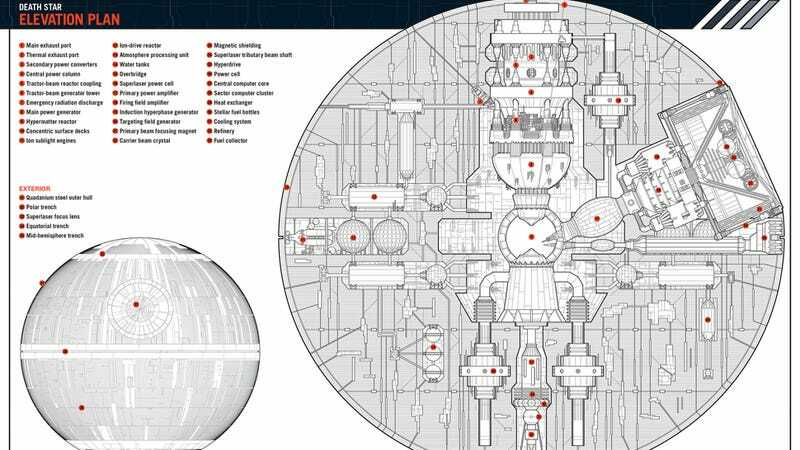 Instead, you can just buy the Imperial Death Star: Owner's Workshop Manual — published by Haynes, the same folks who did the Millennium Falcon owner's manual. We've got an exclusive sneak peek of this masterpiece. Just like the first two volumes, this book is chock full of specs and funny images. Some of the documentation is written by the great Grand Moff Tarkin himself, including his own insights into how you shouldn't overestimate the chances of anyone going against this battle station. There are sections about the early history of the Death Star, plus a special section at the back containing specs for the second Death Star from Return of the Jedi. You'll learn lots of insights — like those structures on the surface of the Death Star are more or less copied from city blocks on various Imperial planets.